This article brings together ancient sacred sites from around the world that align to the spring equinox (also known as the vernal equinox). Even though they are separated by vast distances and time, they share a knowledge of the symbolic spiritual significance of the spring equinox as a time of resurrection and attainment of eternal life. They were built by people in ancient times who had a knowledge of the spiritual process that leads to enlightenment, and who created places to carry out initiations and rites, as well as bring the cosmic eternal forces that are found in this process to earth and into the individual. The time of the spiritual equinox is still celebrated here today, according to its ancient and universal meaning. It is linked to a special stage in the universal process of spiritual awakening, which you can read more about in The Spiritual Meaning of the Spring Equinox. To discover the spiritual meaning of the spring equinox, this article firstly looks at the original traces of its celebrations as set it stone (which are not so altered by time and degeneration as myths and traditions are). The following sacred sites from around the world reveal an incredible knowledge of the spiritual significance of the spring equinox and its relationship to the internal spirituality of humankind. The sphinx (photo CC BY-SA 3.0 by Hajor, edited). One of the most dominant alignments (as there are many both solar and stellar) of the Giza plateau, home to the Sphinx and the Great Pyramids, occurs at the spring equinox. The Sphinx gazes due east to where the sun rises on the morning of the spring equinox. It is estimated that during the era of 10,970 to 8,810 BC (but also prior to that at approximately 36,500 BC) it also gazed directly toward the rising of its own celestial image (known today as the constellation of Leo in the form of a recumbent lion), which would have preceded the sun at dawn on the spring equinox. Due to what is called “the precession of the equinoxes,” the sun rises in a different constellation on the spring equinox approximately every 2,150 years. At that time, the spring equinox sun rose in the constellation of Leo. This reveals, along with archaeological evidence of weathering and esoteric evidence of what the Sphinx was originally intended to symbolize, that the Sphinx is much older than mainstream Egyptologists say—who date it to around 2,500 BC. Furthermore, the causeway connecting the Sphinx to the second of the three Great Pyramids is slightly offset. Again, mainstream Egyptologists argue that this was a design flaw to accommodate the Sphinx into the layout of the Giza pyramids. But it was actually done for a specific esoteric reason—as everything was in the original design of the ancient Giza plateau. Standing on the causeway facing the rising sun on the spring equinox during this era, one could have witnessed the constellation of Leo rising over the horizon just before dawn with its head appearing first before being followed by its recumbent body. Looking across at the Sphinx from the same point on the causeway, this same image is mirrored by the Sphinx itself with only its head visible above the plateau and its recumbent body set down inside a carved out enclosure. The design of the Sphinx interwoven into the spring equinox and the constellations has an important esoteric meaning. It pinpoints the celestial parts while integrating them into an earthly design, which symbolically re-enact the process of the resurrection of Osiris as found in the ancient Pyramid Texts—the oldest surviving sacred texts of Egypt and possibly the world. Close by, the Great Pyramid is designed in such a way that at noon on the spring equinox it casts no shadow. 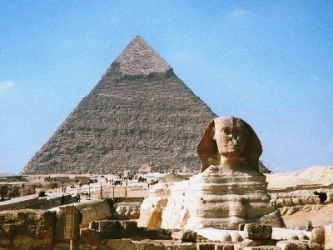 The Sphinx and Great Pyramid are giant symbols, and both are part of a plan on the ground that forms a greater symbol. The pyramids were never built as tombs for pharaohs and evidence has come to light that the Sphinx was not originally built as a man-headed lion, and possibly not even a lion at all, but as the deity Anubis in his form as recumbent African golden wolf who resurrected Osiris. Going back into the most ancient accounts, the Sphinx was a spiritual symbol of incredible significance, which was successively restored, re-carved, and vandalized over thousands of years. It symbolizes the resurrection of Osiris at the dawning of the sun on the spring equinox. This is explored further in the article Decoding the Ancient Meaning of the Sphinx and its Origins as Anubis, which looks at the symbolism of the spring equinox alignment with the Sphinx in more detail. Angkor Wat (photo CC BY-SA 4.0 by Bjørn Christian Tørrissen). Angkor is a massive complex of ancient stone temples in the jungle of Cambodia. The temple of Angkor Wat is its most famous and aligns to the rising sun of the spring equinox. The temple is said to be a representation of Mount Meru, the ancient Hindu home of the gods. The five central towers symbolize the five peaks of the mountain, and the walls and moat the surrounding mountain ranges and ocean. The axis of the temple is offset to give a three day anticipation of the coming spring equinox alignment. On the morning of the spring equinox, the sun rises up the side of the central tower (mountain peak) of the temple and crowns its pinnacle. Angkor Wat is decorated with a massive stone mural that depicts the ancient Hindu story of “the churning of the milky ocean” (along with scenes from the sacred texts the Mahabharata and Ramayana) in which the asuras (demons) and devas (angels) are in a giant tug of war using a serpent wrapped around a mountain, which churns the great milky ocean as they pull back and forth. This churning produces Amrita, the nectar of immortality, eventually consumed by the devas and which allows Indra to return to his abode as the King of Heaven. The churning of the milky ocean reveals a fundamental spiritual principle found in the universe—the role of darkness and light in creation, within ourselves, and in the process of enlightenment. The struggle against darkness and its defeat, which is found in all resurrection accounts, is what leads to eternal life. 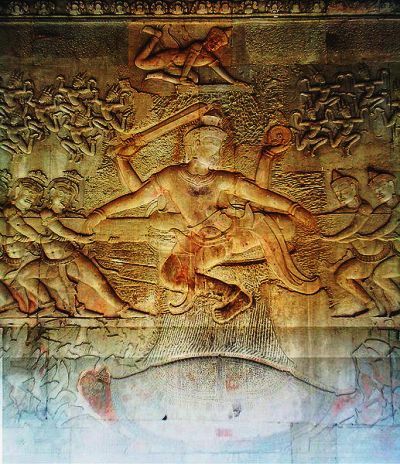 The central segment of the mural of the churning of the milky ocean at Angkor Wat. Vishnu is the large central figure – above him is Indra, below him the turtle in the ocean, and on either side the demons and devas pulling (photo CC BY-SA 3.0 by Markalexander100, edited). This giant relief is found carved into an eastern wall, and is associated with the spring equinox, while other reliefs are associated with the other four points of the year. Researcher Graham Hancock discovered that Angkor Wat and a number of surrounding temples (around fifteen) mirror the constellation of Draco as it would have appeared in the sky at the time of the spring equinox in the year 10,500 BC, many thousands of years before it is said to have been built. With the combination of the constellation of Draco, which is shaped like a giant serpent, and the tower of the temple said to represent Mount Meru, all aligned at the spring equinox, Angkor Wat brings together the counterparts of the churning of the milky ocean in combination with the earth and the sky. In the mural depicting this scene, there are ninety-one demons on the left, representing the number of days between the winter solstice and the spring equinox, and on the right are eighty-eight devas, representing the number of days from the spring equinox to the summer solstice, minus three. Each side measures 54 cubits—together which adds to 108, a number sacred in Buddhism and Hinduism, said by some to be the number of human incarnations one has to awaken in a cycle of the Wheel of Samsara. The numbers 108, 54, along with 72 and 36 (which when taken as individual digits all add to 9), have been incorporated into the design of Angkor Wat and surrounding temples. These numbers are part of the sacred mathematics of the phenomena known as “the precession of the equinoxes,” a cosmic cycle of the earth related to the spring equinox, which the churning of the milky ocean is also said to symbolize. The temple of Phnom Bakheng is surrounded by 108 towers—108 is the sum of 72 and 36 (and 72 is 36 twice). The number of temples built around Angkor is 72. Our earth moves one degree in its processional cycle throughout the constellations every 72 years. Incredibly, Angkor Wat is situated longitude 72° east of the Pyramids of Giza (which also features stellar alignments around 10,500 BC). Even the causeway of Angkor Wat incorporates cosmic symbolism and numbers encoding the cycles of time. The axial lengths along the causeway of Angkor Wat were designed to represent the great world ages of Hindu cosmology called Yugas. Additionally, the temples of Bakong, Prah Ko, and Prei Monli at Roluos, south of the main Angkor complex, mirror the three stars in the Corona Borealis as they appeared at dawn on the spring equinox in 10,500 BC. Interestingly, Corona Borealis would not have been visible from these temples during the tenth and eleventh centuries when they were said to have been constructed. Temple of the Grand Jaguar at Tikal (photo CC BY-SA 2.5 by Raymond Ostertag, edited). Tikal is an ancient series of temples located deep in the jungle of Guatemala. Like many ancient sites in Central America, the temples here were successively built over, which means that their origins are actually much older. Here, tall pyramid style temples rise out of the canopy of the rainforest. On the spring equinox, the sun rises up the middle of The Temple of the Grand Jaguar with its nine terraces to crown its pinnacle. In doing so, it causes the temple to cast a perfect shadow over the much smaller Temple of the Moon, which has three terraces and was decorated with a wooden lintel showing the image of a royal woman (the original stone mantle of the temple is too dilapidated to make out whether there was anything originally carved into it). This visual “absorption” of the feminine moon temple into the shadow of the Temple of the Jaguar—may have represented how someone becomes one with the Mother at the stage of resurrection. The Temple of the Grand Jaguar was decorated with a wooden lintel depicting a jaguar with water lilies sprouting from its head, protecting the King (again the original stone mantle is worn away). The jaguar is an ancient Maya and Olmec symbol dating back to the earliest recorded cultures in Central and South America, with depictions that date from around 1,500 BC. The water-lily jaguar was considered a transformer, and could also be depicted amidst flames. The meaning of the water-lily jaguar remains obscure in Maya culture, however the jaguar itself has parallels in many esoteric teachings as the tiger the Hindu warrior goddess Durga rides upon, the lion-headed warrior goddess of Egypt Sekhmet, and the Buddhist lion-headed goddess Senge Dongma—each also associated with fire. The jaguar of Central America (like the lion and tiger) is the equivalent symbol of the fierce war against darkness and evil within the initiate. Known as the god of terrestrial fire in Central America, it is symbolically related to the inner alchemical fire which transforms someone spiritually. The jaguar was considered the night sun—the form the sun takes in its journey through the underworld. At the time of the spring equinox the sun rises from out of the underworld to defeat the darkness. The rising of the sun was very much associated with resurrection to the Maya, and again resurrection is symbolized at this site at the spring equinox as in many other ancient esoteric sites around the world. A plate illustrating the resurrection of the Maya maize god of resurrection was also found at Tikal. The complex at Tikal includes many other solar and stellar alignments, including to the solstices and to the star cluster the Pleiades. Like other Central American sites, Tikal descended into human sacrifice and bloodletting. Graffiti inside the temples depicts scenes of sacrificial victims. Again, this was a horrific distortion of the original spiritual teaching as has happened so many times in the past, and why spiritual knowledge is continually given anew. Cairn T at the site of Loughcrew (photo CC BY-SA 2.0 by William Whyte, edited). Thousands of years ago, Ireland was inhabited by the Tuatha Dé Danann—a mysterious god-like people most closely connected with the ancient megalithic sites of Ireland. They were said to be preceded by the Fir Bolg, another mythical ancient people. While the ancient history of Ireland turned into legends and myth passed on verbally over thousands of years, what is known as set in stone is that Ireland was once inhabited by a highly astronomically advanced people who had knowledge of esoteric principles, which they incorporated into the design of their megalithic temples. 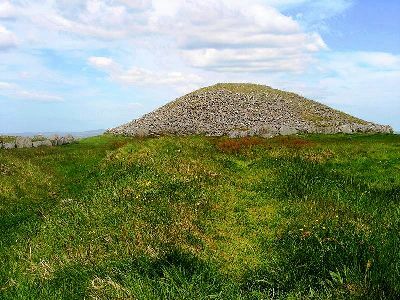 Cairn T is the name given to an ancient neolithic mound with an inner chamber that aligns to the equinoxes, and is believed to have been built around 3,500 BC (and was even possibly built on an older sacred site). It is the main and central mound in a group of neolithic sites at a place called Loughcrew, which originally had around forty monuments. It is thirty-five meters in diameter and was once covered in a thick mantle of quartz. The rising sun on the spring equinox enters the mound and travels into its inner chamber which is in the shape of a cross/cruciform, to alight the back stone, called the Equinox Stone, which is covered in astronomical symbols. The equinox sun, viewed from Cairn T, rises over the Hill of Slane, which is a sacred hill that is framed by the view looking back out from the chamber of Cairn T. The Hill of Slane formed part of a larger equinox alignment in ancient Ireland as described in the Millmount-Croagh Patrick alignment further on. This is about 1/2 of the chapter on the ancient sites aligned to the spring equinox. Keep reading in the book The Path of the Spiritual Sun.